Yesterday F5 Networks acquired our portfolio company NGINX for $670M (enterprise value) and here at Runa Capital it is the perfect reason to pause and thank the NGINX team for their success. We would like to share our own memories of this story — how a few outstanding software developers created the #1 web server company in the world, powering more than 40% of the modern internet. It all started in 2002 when Igor Sysoev, working at the large internet company Rambler, saw first-hand that there was not a reliable web server that could handle tens of thousands of simultaneous connections (the so-called C10K problem). As the number of internet users continued to grow, there were more and more websites running into this challenge. Even well-known products like Apache were not able to reliably solve the problem. Igor started developing his own solution using asynchronous event-driven architecture and publicly released it in October 2004 as NGINX [engine x]. Since the release, the open source community embraced the solution, which became viable as a web server in 2007 and had a 6% market share among all websites by the end of 2010. Birth of smartphone market in 2008 led to exponential growth of mobile internet users and caused additional C10K problems for vast amount of websites — the epoch of NGINX mass adoption has come. By spring I had finally decided to found the company which would help to further develop the project. This step was partially inspired by Serguei Beloussov, the founder of Parallels and venture fund Runa Capital. 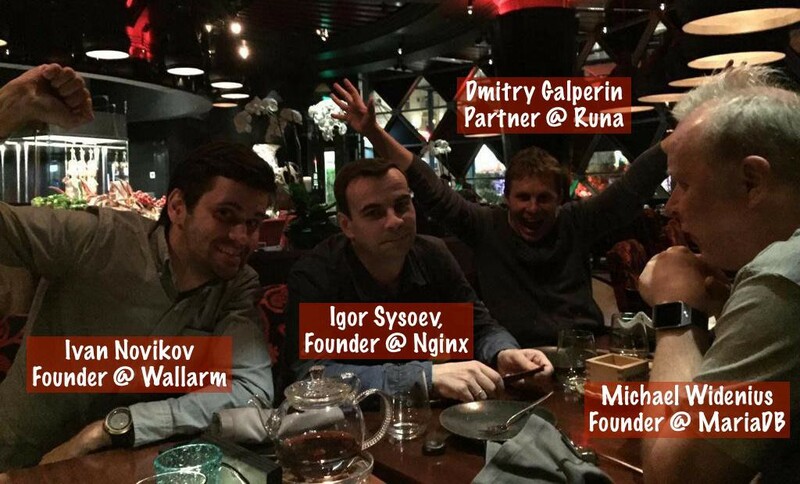 In June 2011 Igor left Rambler and founded NGINX, the company, together with his co-founders, Max Konovalov and Andrew Alexeev, and began raising a Series A round. At that moment, we already knew this team well and were deeply impressed with the technical expertise and vision of the founders. However, it was a very competitive deal for investors — despite zero revenue, NGINX had noticeable market traction, and many top tier global VC firms were interested in the startup. In truth, Runa nearly lost this deal, but due to our strong enthusiasm on opportunity to turn NGINX into a global leader (we were impressed by the beauty of the product and felt confident about its potential) and support from the founders, Runa became part of a syndicate and co-led $3M Series A round together with BV Capital (now — e.ventures) and MSD Capital (as part of our due diligence process, we introduced Michael Dell to the founders and he then became part of the syndicate). The deal was closed in August 2011, and we invested our first $1M into the company. At the beginning of 2012, NGINX had fewer than 10 employees (only R&D) and no paid products, however its global market share grew to 10% (W3Techs). While the product already had great community adoption, the commercial side still had to be built. The founders launched paid support for the free product and the company’s board of directors began to search for a US-based CEO, someone with experience in monetizing open source software. The hiring of an experienced CEO was a step agreed upon with the team before the Series A, and the investors, including Runa, really respected their decision. The founders desired to build a global business, but understood their own limitations, thus wanted to hire an executive with business expertise so they could focus on product development. All shareholders used their connections to find the best candidates for the CEO position, and the chosen candidate was Gus Robertson, who was sourced by a former senior executive at Red Hat (the leading global open source company with $3B+ in annual revenue), one of LPs in Runa. Gus had an impressive background in open source technology, was very energetic and showed outstanding intelligence. Most importantly, we felt that he had a great cultural fit with the company. 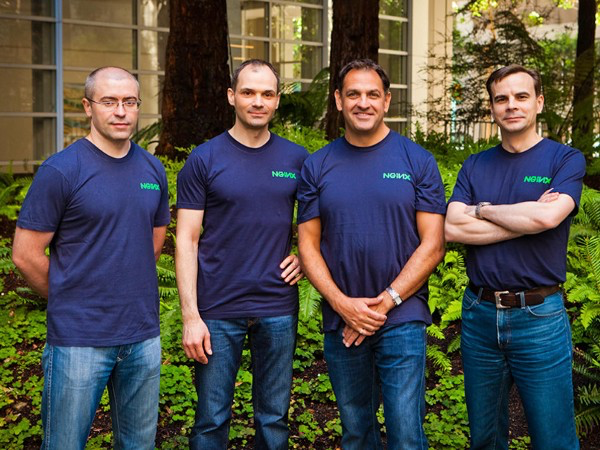 Indeed, when Gus met the founding team of NGINX, they all turned out to be on the same wavelength. Gus left his VP position at Red Hat, joined NGINX in December 2012 and also offered to personally invest in NGINX. The whole NGINX team and the investors were very impressed by his level of commitment. Since then, he has always been considered a part of the founding team. 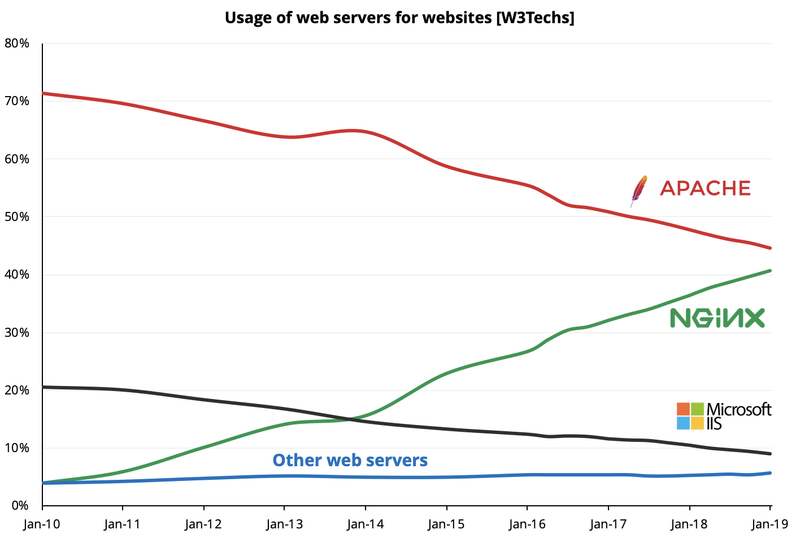 April 2013 was the breakthrough month for NGINX — the company publicly announced appointment of Gus as the CEO and surpassed Microsoft IIS in active web server market share with over 22M active websites. In late 2013, the team launched their first commercial product (NGINX Plus), set up its headquarters in San Francisco and hired its first sales executives. The core team of NGINX was set, and the only missing part of the puzzle was additional capital for further commercial development. The company decided to raise their Series B round to further scale the business. Gus managed the fundraising process perfectly, resulting in three term sheets from well-known Silicon Valley investors, and ultimately the founders chose NEA to lead the $10M round. While all three shortlisted VCs offered good terms, NEA proved they wanted the deal much more than the others (just like Runa did in the Series A round). Other investors, including Runa, also participated in the round. Surprisingly, many top venture investors did not fully understand open source software (OSS) at that time, and passed on the opportunity to invest in NGINX. Today, after MongoDB’s IPO and the large acquisitions of Red Hat, Mulesoft, Github and other OSS success stories, the market landscape for open source has definitely changed. In 2014 NGINX booked their first $1M and began to scale the business, resulting in a concrete commercial strategy and requiring additional capital to supercharge the sales team. Existing investors were happy to support that plan and continued to be super-bullish about NGINX. All rounds until the Series C were primarily internal — shareholders injected an additional $20M in the Series B1 round (led by NEA) — with a few exceptions for new value-adding investors Index Ventures and Telstra Ventures. In the last few years, the company has widened its product range by launching NGINX Amplify (a SaaS-based monitoring tool), NGINX Controller (an API management tool) and its outstanding new product — NGINX Unit, a dynamic web and application server. To support further expansion, the company raised a $43M Series C led by Goldman Sachs and NEA in June 2018. 374 millions of websites use NGINX due to its high performance, including the majority of the 100K busiest websites such as Airbnb, Box, Dropbox, Netflix, Tumblr. Today NGINX is the clear market leader, powering more than 60% of the TOP 100K websites in the world, with fast-growing revenues and more than 1,500 enterprise customers, including Instagram, Pinterest, Netflix, Airbnb, Adobe, Cloudflare, etc. 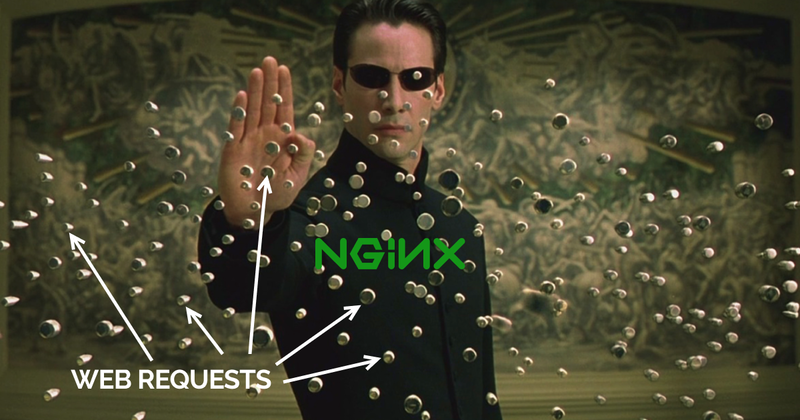 If you imagine any popular and widely used website (apart from those in the Microsoft and Google networks), it is likely powered by NGINX. It is no wonder that NGINX has captured the interest of large-scale tech corporations. We are happy that F5 Networks made a compelling acquisition offer, and we hope to see the combined entity continue to flourish in the future. As Gus mentioned in his recent post in NGINX blog: “No one in history had built a successful commercial entity around a web server. Many have tried, none with success.” Fortunately, Runa had a chance to support those outstanding people who did. Congratulations to the founders, the management and the investors! It was an amazing journey and we are very pleased to share it with you. 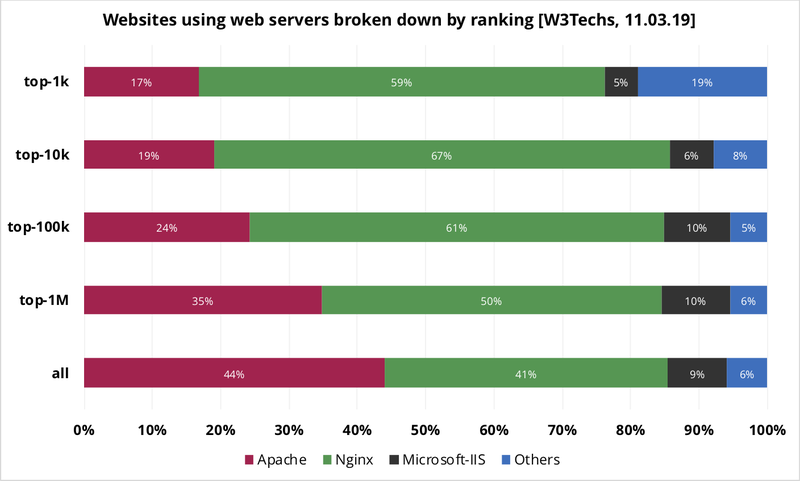 NGINX will beat Apache and become the #1 web server on the internet quite soon — around Q4 2019, according to the W3Techs chart above. After recent M&A activity, the open source model is gaining momentum and the NGINX deal further accelerates the process. The market share of OSS is growing steadily — and as a VC investor we are excited about it.